Walking Spirit: March 13, 2006 -- A Special Day! March 13, 2006 -- A Special Day! Hope you have a great birthday, cousin! I love you!! Please join me in wishing Jeremy a happy birthday! We're all thankful you are here to celebrate another birthday so you should make this one a real celebration! 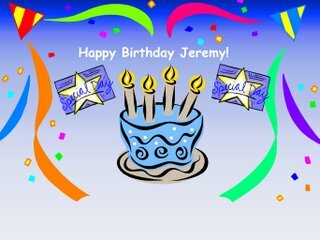 Jeremy--Have a great birthday! Every birthday should be good from here on out! 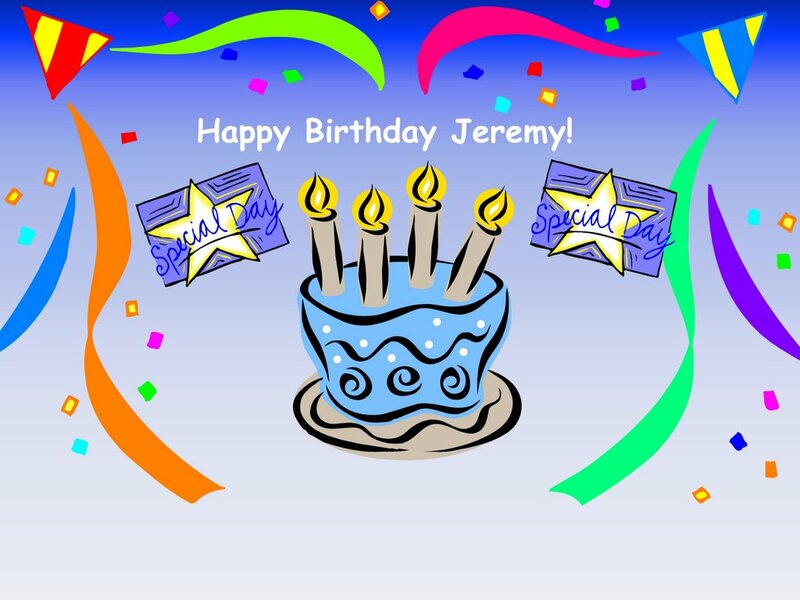 Have a wonderful day Jeremy! We were all so thrilled to see you on Saturday...we had a great time. You really look good and we are anxious to know how everything progresses. You and your family are angels among us! We love you Jeremy! The kids pray for you daily! I agree w/Annie. Go out and celebrate this one in a big way! Today is your birthday (sing along!!!) ... what a celebration day it is! Yee-Hah!!! We love you, we wish you well and we will continue prayers. You little brat keeping that one quiet and your friends as well...shame on you, this should be a day of celebration. I know I am celebrating your life. Thanking God everyday that you are with us. Celebrate good times, come on (sing along)...happy birthday old man! ENJOY IT...but I'm still older. I guess jeremy got a great birthday wish...his new leg makes him taller than me by at least 3 inches now...who else can get that for their birthday? Save the frosing for last!!! Happy Belated Birthday Jeremy!!! Please forgive us for not writing sooner. We have been amazed and speechless at this whole ordeal. We are grateful that you are still with us and what would the world be without you! :-) We haven't talked in quite some time, but we haven't forgotten about you. We wish you the greatest recovery and keep us informed of your journey. May God bless you. Jeremy! Happy Birthday, a little late, but better... Hope you had an excellent day when yet, again, all the attention was on you! Hope you realize just how special you are to all of us and to God. We love you and continue to pray for your future successes on this journey we call life. God bless. HAPPY BIRTHDAY!!! A day late, but that just extends the birthday fun. I hope you had a great one! I hope you had a wonderful birthday! You are always in our thoughts - can't wait until we see you again. Sorry we missed that but I will buy the drinks in Indy later this month! Take care and hang in there. Glad to read all the progress.